This essay was written some months back, when the sentence against J S Tissainayagam was first pronounced. It may be worth rereading now, after he has been pardoned. As indicated there, I feel we should feel primarily sympathy for someone who fell victim to a mindset propagated by those who should have known better. Correspondingly, while we respect those who held themselves aloof from the mad scramble to dignify the LTTE, we should continue to be cautious about funding agencies that pursue their own predilections, even if these are contrary to Sri Lankan interests and the policies of our elected government. The sentence passed on the journalist J S Tissainayagam has prompted diverse reactions, but to my relief they have generally been more civilized than I expected. Happily, there have been no triumphant justifications of the prison sentence, excessive as it seems. Conversely, except for the few usual suspects, there have been no categorical condemnations of the verdict of guilty, perhaps because the sentence itself has seemed ample grounds for complaint for those who deplore what seems a betrayal of a fundamental right, that of free expression. Underlying this comparative restraint perhaps is the fact that everyone recognizes that there should be certain limits to freedom of expression, namely when it could contribute to the erosion of other freedoms. Hate speech is an obvious example of what should be controlled, and equally obviously, as Subramaniam Swamy put it in an article in the Economic Times of India, ‘when a state fights a secessionist terrorist outfit, then press freedom suffers as a consequence’. Swamy himself believes, having read Tissainayagam’s writings, that ‘they are pure LTTE propaganda’. And, even if one does not go as far as that, the comments of a relatively liberal foreign journalist, who was instinctively against the sentence, make clear what a detached observer would have felt, namely that ‘he was clearly supporting the LTTE’. Why then do I feel that, even though he might have been guilty of the crimes with which he was charged, the sentence is excessive? This is not an official perspective, since the sentence was passed by a branch of government, and it would be inappropriate for those working for the executive branch of government to take a contrary formal view. But feelings are free, and in this instance I believe they are shared by other elements in government, if one might judge by the speech of the Attorney General at the meeting to adopt a Framework for the Rehabilitation of Ex-Combatants. He talked there of the need for reconciliation and, while he put it in legal language that I cannot hope to paraphrase, I too believe that the rehabilitation and reconciliation that are now essential require some indulgence towards those who may have supported the LTTE. There surely must be a distinction between active proponents of terror and those who were driven into inappropriate acts, the children who were conscripted, the public servants who were pressurized, even the politicians who succumbed to what they thought was the inevitable. Tissainayagam to me was one who was pushed as it were into support of the LTTE. I have not yet read the judgment, but from what I have seen of the case that was presented, it seems to me that he was unwilling to go too far. Thus, when the LTTE offered him money, he tried to refuse, and it was only when he saw no alternative that he accepted what they gave. Again, as the thoughtful foreign journalist put it, though Tissainayagam’s writings were ‘largely critical analysis from a very obvious point of view’, they were ‘without some of the madder claims like genocide’. In short, Tissainayagam tried to maintain some sort of journalistic integrity, and in that regard he deserves sympathetic consideration, unlike those who falsify with no compunction. My approach, I should note, may be prejudiced, since I believe I was the first person to publish his writings, way back when there were hardly any outlets for writing in English (others in that category were Richard de Zoysa and Qadri Ismail, though fool that I was I turned down Shyam Selvadurai’s early attempts at poetry). 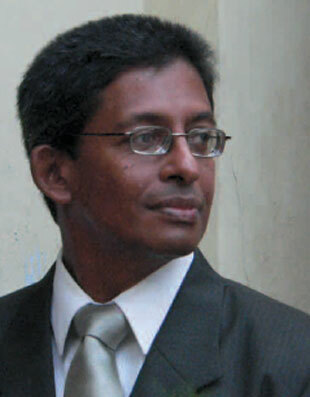 But leaving aside the sentimental, I believe Tissainayagam deserves indulgence for another reason, namely that he was a victim of the mindset of the Ceasefire Agreement period, when the message conveyed to all and sundry was that the LTTE would surely inherit the earth, or at least the North-East portion of Sri Lanka. It took courage then to resist that tide. That is why, when I suggest indulgence for those who went with the tide, I also register the importance of honouring those who stood out at grave personal risk, Devananda and Sidharthan and Anandasangaree and Srikanthan, later Karuna and Pillaiyan, and so many unsung Tamil officers in the armed forces. They were at risk of their lives, and many of their associates suffered, most recently Maheswari Velayuthan, shot when she went to visit her sick mother. They should not be forgotten. I make no apologies for my anger when I hear denizens of Colombo claiming that Lakshman Kadirgamar knew the risk he was running, as though that somehow excused him being killed. But it is precisely because one celebrates those who were courageous enough to stand out, when all their peers were losing their heads and kowtowing to terror, that one registers the enormity of the pressures brought to bear, and advocates sympathy for victims of the lemming-like mindset that 2002 created. And it was not only the local political dispensation then that pushed the LTTE cause. I first had reason to note the strength of the forces ranged against the government as it sought to overcome terrorism when I found out how aid was being used to undermine government policy. I would like to think this was not deliberate, it was simply a hangover from earlier years, but such carelessness seemed to me culpable. I first began to understand what was going on when Dominic Chilcott, who called on me shortly after I took over at the Peace Secretariat, said he could not really help government initiatives to promote peace, since the British gave funding only to Non-Governmental Organizations. Much funding he said had gone to the Centre for Policy Alternatives, and to the Foundation for Co-Existence. When I expressed surprise at the former, given that by then CPA had set itself very firmly against the government, he said that that had changed, and they now worked instead with something called FLICT (Facilitating Local Initiatives for Conflict Transformation). Incidentally, when Liam Fox asked a question in Parliament about how British aid was used, he got a very different reply, which surprised me. I have however since learned that aid is a matter of interlocking directorates, and cascading sub-contracts mean that, without this being obvious unless one pursues a long paper trail, all sorts of odd agencies meddle and make money, albeit occasionally the Sri Lankan people also benefit. I had occasion shortly afterwards to examine FLICT funding, and found that it went to several organizations that seemed to have done nothing much to promote peace (this was the thrust also of a review done shortly afterwards, which suggested a different approach, though FLICT has now forgotten their earlier commitment to keep me informed of what would be done). Apart from the general uselessness of what had been paid for, I was astonished also by the way in which a few institutions, some of them represented on the FLICT Board, had got most of the funding. Young Asia Television dominated in this regard, but one of the largest recipients of funding seemed to be Tissainayagam. He had it seemed received separate grants for what I was told were websites in different languages. I do not think FLICT bothered to check as to what appeared on those websites, courtesy of their funding – perhaps on balance it would be even less creditable if they were checking but did not care. Certainly CPA had no qualms about claiming that they had Canadian and Australian funding for ‘Groundviews’, even when they were talking about the ‘President and his coterie of murderous brutes’. And, whereas Australia promptly denied when I asked that they funded this sort of thing, Canada under Angela Bogdan of blessed memory did not even bother to reply. Subsequently however Groundviews changed its blurb to note only that it had received seed funding, and perhaps over the last couple of years the so-called international community has indeed changed its approach. But there is no doubt that, at the time Tissainayagam’s writings were lending credence to LTTE propaganda, he himself would have thought that the world, or rather the Western part of it, was his oyster. He was getting funding from them, he was part of the social whirl of Colombo that did not really mix with the government, it is no wonder that he felt justified in what he was doing. My argument then is that Tissainayagam would not have seen himself as presenting an LTTE point of view. This was the point of view of the civilized world as he knew it, the Colombo Seminar and Cocktail Circuit, the English speaking politicians of the UNP and the TNA (which indeed he represented at meetings of the One Text Initiative), the leading lights of what he saw as Civil Society, Western diplomats, the bright young things of what termed itself the international humanitarian aid community. The mindset would not have been easy to resist, and there was no reason to try anyway, given the polarizing which these elements promoted. But that he tried not to accept money from the LTTE is clear from his confession, and in that respect I think it should be recognized that he is different from those, for instance, who peddle false information with no compunction. I would have hoped then that he would have got a suspended sentence for the use of money from the LTTE, and simply a token sentence for the writings that caused ethnic disharmony. It would also have seemed natural for the sentences to have run concurrently, so that he would soon be free, given how long he has been imprisoned already. I have no idea whether the sentences can be commuted now, but that would certainly make sense. The negative aspect is that the hordes that pumped him up to think propaganda against the government (though not for the LTTE) was virtuous will probably see him again as an instrument to promote the polarization they so desperately need. Still, the government can afford now to be magnanimous, and should recognize that some risks are worth running if we are to achieve the reconciliation we now need.